Fusion London, on Loxford Road, saw a former chocolate factory site in a well- established residential area of Barking transformed by Home Group into a mixed- tenure development of modern one and two bedroom apartments. The development offers much needed affordable and shared ownership apartments, giving local people the opportunity to continue to live in the area and commute, with excellent rail links into and across London. 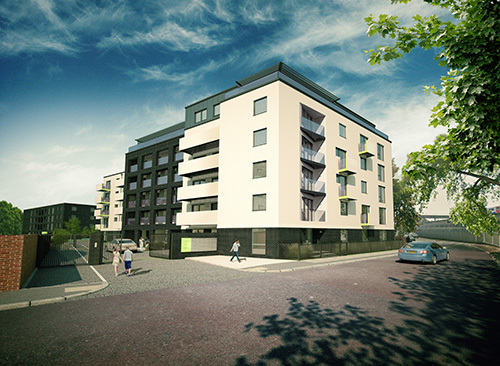 Each apartment offers a bright, airy and stylish contemporary living space, giving first time buyers a well needed chance to get on the property ladder, whilst benefiting from green and energy-saving technology. And the design doesn’t stop inside; great creativity has been used to develop the outdoor living space, incorporating fruit trees, gardens, courtyard areas, roof terraces and seating. The gated residential access enhances safety and privacy. The sales success at Fusion London confirms that these stylish, modern and affordable apartments are perfect for first time buyers.